Is there an opportunity hiding in plain sight? Perhaps a leap spread opportunity? 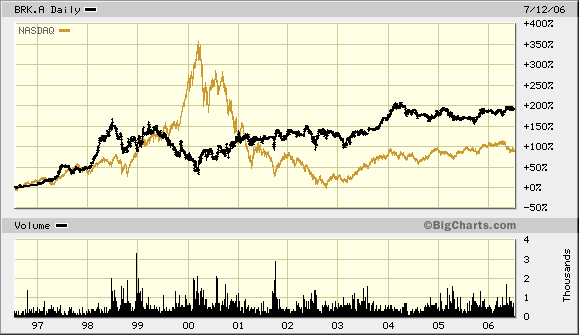 Why did Balmer go now and what can ValueAct help Microsoft do in terms of capital allocation? Perhaps the risk/reward allows for an opportunity? Do you own work. Plus, you can study ValueAct’s other investments. This is just one tiny tool and not one to place all your marbles, but with high sentiment there isn’t room for error (witness AMZN today–down in price by over 6%). I expect that if a downturn occurs in asset prices, the monetary fire hoses will be turned on high. But if monetary growth continues to decline (unless the “air” being pumped into the debt balloon increases, the balloon begins to sag). I will add to my shorts in CRM, GE gingerly. Here are the steps one can use to calculate this data, which all comes from the Federal Reserve weekly release identified by the Fed as H.6. From the H.6 release, go to table 2 and look for the non-seasonally adjusted, 13-week M2 data. then use non-seasonally adjusted data. You want to know how much money is out in the system bidding for goods and services. Second, use 13 week average rather than single week data because there can be a lot of noise in the system from week to week, depending upon where money is flowing to and from in the system. This causes the data set to move more slowly, but it also means it is less volatile and less likely to set off “false positives”. Finally, take the 13 week average of a 3 months ago (12 weeks) and calculate the change against the current week, then annualize this result by multiplying by four. The reason you should annualize the quarterly change rather than look at the full 12 month period is that money entering the system now will have an impact now. If I use a full 12 month data set, the change may not be detected for months, if at all–especially given the up and down changes in money supply witnessed during the Bernanke era. 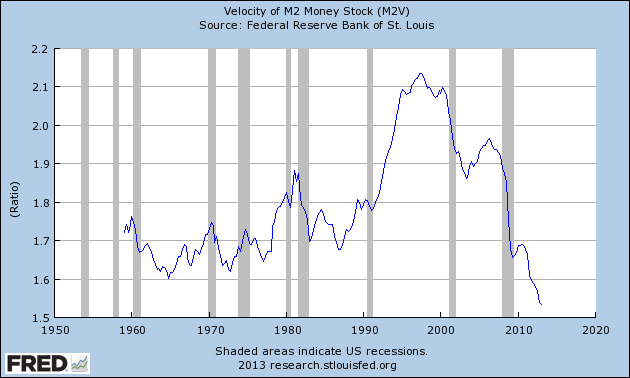 A further note on the current decline in money growth is that it is not occurring because the Federal Reserve is not pumping money into the system. During this same period, the last 12 weeks, the monetary base has been growing at 25% plus. (See the Fed’s H.3). 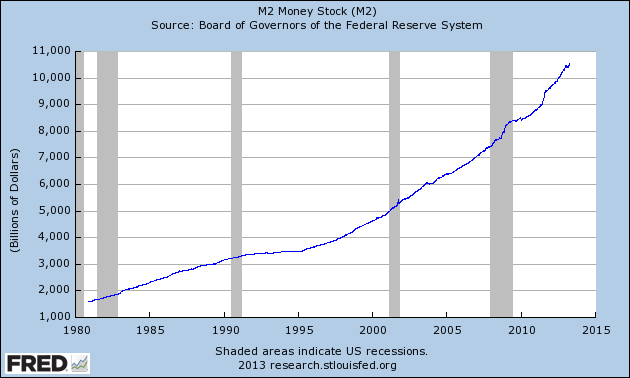 The high-powered money the Fed is creating is simply ending up back at the Federal Reserve as excess reserves. Banks are not lending the money out and are content to place the funds at the Fed. Excess reserves from end December 2012 to End March 2013 have gone from $1.5 trillion to $1.7 trillion, an annualized growth rate of 53%. Perhaps that is why commodities and gold have been weak? Therefore, I am looking for a sanity check. Right now I feel that Small or Micro Cap’s are out of my circle of competence. My game plan is to hold cash until the next major market down turn, and hope Berk A comes down to a point where I can purchase. Do you think the market is over priced in relation to the stocks mentioned above? What would you do with 150k right now? Reply: I can feel your pain. The financial repression is pushing many people to take on risk to preserve and grow their wealth. I am assuming that this money is what you have totally dedicated to equities. 10 to 12 names gives adequate diversification and 20 is probably too much to to follow. Don’t forget that your best opportunities may not be today, but tomorrow. I will come back to answer your question in more detail in a few days because I am on the road, but you should not get caught up in whether the stock market will go up or down. NASDAQ was about to crash, but would that knowledge have kept you from buying Berkshire. I hope not. Buy Berkshire/Short the NASDAQ! Are these companies understandable to you? Who is on the other side from you or why is there a mis-pricing? What price should you pay based on your required rate of return, and do you have a margin of safety? You first have to value each company then determine your required rate of return–what price will you pay. This blog has several case studies on valuation–use the search box in the right hand corner. Perhaps some readers can advise until I return. Hang in there. Patience. I feel a bit like the Vet last in line to board the plane before leaving ‘Nam when offering advice–see last 15 seconds of this clip.